Last weekend J made a delicious Chili Con Carne for our tea. He started cooking first thing in the morning and by the time we tucked in around 7pm the flavours had all intensified and the smell was truly mouth watering. Unfortunately I forgot to get my camera out while he was cheffing away, fortunately I didn't forget when I cooked up my favourite accompaniment to Chili, Cornbread. I always make mine muffin style, I think because the first time me and my Mum ever tried these it stuck to the pan big time, absolute disaster! You can make this in a cast iron skillet though if you prefer, just make sure it is well greased. 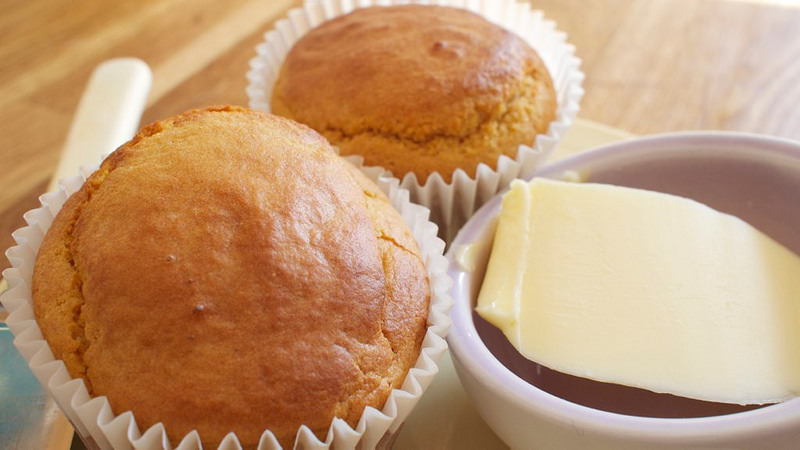 I also like mine plain, as there is nothing better than a warm cornbread muffin straight from the tray split with your thumbs and given a dollop of butter, it melts into a crumbly sweet mouthful that goes perfectly with the tang of tomato in the Chilli. Pre-heat your oven to 180 degrees Centigrade (Gas mark 5) and line your muffin tins with muffin papers, I made exactly 12 muffins from this mix. In a large bowl mix together the flour, cornmeal, baking powder, salt and cumin. In a medium sized jug break in your eggs and mix in the buttermilk, milk, honey and melted butter. I don't know about you but I always have to warm my honey to get it to go liquid again, I stick the jar in a bowl of freshly boiled water and it does the trick. Once brought together scrape down the sides and mix on medium until the batter is smooth but for no longer than one minute. Leave to rest while the baking powder does its stuff for a couple of minutes, then using an ice cream scoop, or a spoon if you don't have one, scoop one measure into each muffin case. Lick clean the bowl and scoop. Bake for 20-25 minutes until golden on the top and springy when pressed. Allow to cool in the tray for a few minutes before removing to a wire rack. Scoff the lot with a dollop of butter! Yum!